Committing These Common Commercial Plumbing Violations? 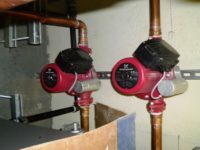 Your Burroughs business needs to ensure that their heating, plumbing, and sprinkler systems are all up to code and not causing any violations. Unfortunately, it is possible that you may be committing some of these violations without even realizing it. Here's a list of the most common commercial violations and how you can avoid them in your business. Modern plumbing code states that you need to leave at least 15 inches between the center of the toilet and any wall. Failure to do this can cause a cramped area that is uncomfortable and difficult to use. It may also cause problems with your building plan. A good drain pipe needs at least a full three-inch pitch at an average of one-eighth of a slope per every foot of pipe. Failure to achieve this sloping will cause your pipes to back up and cause multiple violations that can be expensive to fix. Many commercial businesses don't understand the nature of clean-outs. These areas are necessary for proper maintenance of your system and need to be easy to access. Unfortunately, you may be causing multiple violations by placing them under furniture or other plumbing systems and making them inaccessible. Failure to properly assess and avoid these violations can be an expensive proposition for the average company. Thankfully, we're here to help. At C James Plumbing, we can analyze your problem and fix it quickly and easily. We are experts at managing plumbing, heating, and sprinkler violations quickly and getting your Burroughs business back and running well again.